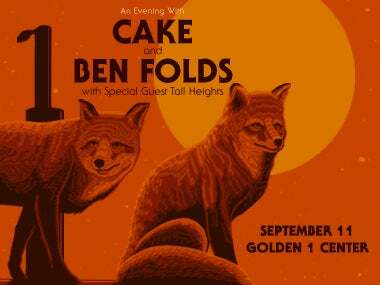 Based on the huge success of the first tour, which Pollstar noted as one of the highest grossing co-headline tours of summer 2018, Ben Folds and CAKE are reuniting for a second round of shows beginning September 7 in Bonner, MT. The co-headline tour will be making stops at venues across the West Coast including Golden 1 Center on Wednesday, September 11. Tickets go on-sale this Friday, April 19 at Golden1Center.com. "We had so much fun with Ben last summer that we decided to do it again, this time in the west," says CAKE's front man John McCrea. CAKE's multi-instrumentalist and backing vocalist Vince DiFiore adds, “Last year we had the great honor to tour with Ben, who inspired us with incredible musicianship and memorable songs. It was sad to end that tour, so now a great thrill to be anticipating another with the actual artistic advisor to the National Symphony Orchestra." For complete details, please visit CakeMusic.com/Tour and BenFolds.com/Tour-Dates. During this tour run, Folds will be releasing his first book, a memoir entitledA Dream About Lightning Bugs - A Life Of Music And Cheap Lessons. Before each show on the tour, he'll be hosting pre-show VIP events where he'll sign copies of his book and conduct a masterclass and Q&A. For more on his book, please visit PenguinRandomHouse.com. CAKE's adherence to their original guiding principles has only grown stronger. Originally formed as a somewhat antagonistic answer to grunge, CAKE's democratic processes, defiant self-reliance, and lucid yet ever-inventive music has made them a nation-state unto themselves, with no obvious peers, belonging to no school. In addition to writing, arranging, producing, and performing their own music, they have taught themselves to engineer their recording projects in their own solar-powered studio, which actually generates more power than is needed to run it, causing the building's electrical meter to run in reverse. CAKE's most recent album, Showroom of Compassion, debuted at #1 on the Billboard Top 200 Album Chart and was touted as "deadpan brilliance" by the New Yorker. The band is currently in the recording studio working on their ninth album due for release during autumn 2019. In the meantime, CAKE will be releasing a series of 7" vinyl singles, starting with last autumn's protest song, SINKING SHIP. For more, please visit CakeMusic.com. He's created an enormous body of genre-bending music that includes pop albums with Ben Folds Five, multiple solo albums, and numerous collaborative records. His last album was a blend of pop songs and his Concerto for Piano and Orchestra that soared to #1 on both the Billboard classical and classical crossover charts. For over a decade he's performed with some of the world's greatest symphony orchestras, and in 2017 was named as the first ever Artistic Advisor to the National Symphony Orchestra at the Kennedy Center. In addition to touring, Folds has recently written his first book - A Dream About Lightning Bugs - described as a collection of interrelated essays and anecdotes about art, life, and music. Release is slated for July 2019. He is also no stranger to television, having been featured for five seasons as a judge on NBC's critically-acclaimed a capella show "The Sing Off," continues to appear in cameo roles on cable and network TV shows, and composes for film and TV. An avid photographer, Folds is a member of the prestigious Sony Artisans of Imagery, completed an assignment in 2017 as a photo editor for National Geographic, and was recently featured in a mini-documentary by the Kennedy Center's Digital Project on his photographic work. An outspoken champion for arts education and music therapy funding in our nation's public schools, in 2016 Ben held the distinction as the only artist to appear at both national political conventions advocating for arts education, has served for over five years as an active member of the distinguished Artist Committee of Americans For The Arts (AFTA), and has been appointed to the Board of AFTA's Arts Action Fund. He was also recently named Chairman of the Arts Action Fund's ArtsVote2020 national initiative to advocate for a greater commitment to the nation's creative economy through improved public policies for the arts and arts education.